Cartoon by Duverdier. Posted on Twitter by Jean-Baptiste Daubier. Ellery Roberts Biddle, Hae-in Lim, Bojan Perkov, Kevin Rothrock and Sarah Myers West contributed to this report. Global Voices Advocacy’s Netizen Report offers an international snapshot of challenges, victories, and emerging trends in Internet rights around the world. 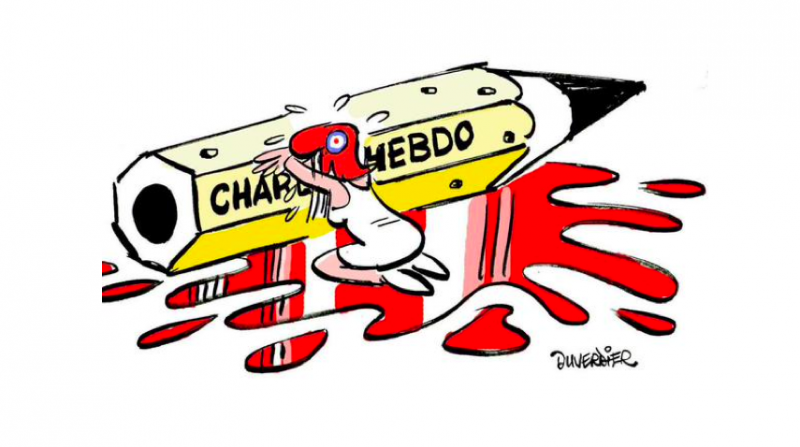 We begin this week’s report with a glance at worldwide responses to the attack on French satire magazine Charlie Hebdo. The attack has sparked a critical debate over the importance of free expression—but even as millions of EU residents marched in solidarity with the magazine, several governments in the EU and beyond made moves to restrict free speech and increase their surveillance powers. Interior ministers of 12 EU countries, including the United Kingdom, France, and Germany, called for an increase in Internet censorship including a greater role for Internet service providers in reporting and removing material inciting hatred and terror. French police are already taking advantage of new digital monitoring powers granted under a surveillance law passed a year ago, allowing them to collect real-time phone and Internet data without judicial oversight. Meanwhile in Russia, numerous users reported that images from Charlie Hebdo were no longer accessible via Kremlin-owned search engine Sputnik. The new legislation would cover both the collection of communications metadata (i.e., information about when a call is made, who made it, and who was called) and communications content (i.e., the interception of calls and online communications). All interception would need legal approval by the home secretary or foreign secretary. Deputy Prime Minister Nick Clegg criticized the proposed legislation, arguing that it would “do absolutely nothing to deal with the issue” and would harm the very fundamental rights that EU governments are supposedly trying to protect. For David Cameron’s proposal to work, he will need to stop Britons from installing software that comes from software creators who are out of his jurisdiction. […] Cameron is not alone here. The regime he proposes is already in place in countries like Syria, Russia, and Iran (for the record, none of these countries have had much luck with it). There are two means by which authoritarian governments have attempted to restrict the use of secure technology: by network filtering and by technology mandates. A Russian-speaking woman in Kazakhstan was charged with “inciting ethnic hatred” for several anti-Kazakh Facebook posts praising Russian President Vladimir Putin and the former USSR. She faces up to seven years in prison for her messages. Many users of Russian social network VKontakte have applauded her prosecution. Saudi Arabia initiated the public flogging of blogger Raif Badawi this week, who last year was sentenced to 1,000 lashes and 10 years in prison for cybercrime and insulting Islam. In 2012, Badawi co-founded the Liberal Saudi Network website, which is now banned. As per his sentence, Badawi was flogged 50 times and will continue to receive 50 lashes each week. He will also have to pay a fine of 1 million riyals (USD $260,000). The Beijing Times published screenshots of several purchase orders for surveillance software that were posted on the website of Wenzhou’s public security bureau. Beijing Times published a surveillance software purchase order, reportedly made by a local police department, on Weibo. Beijing Times found the purchase order on the website of the Wenzhou district police department, took a screen capture of the order, and posted it on social media with a brief explanation of its origins. The purchase order includes two items: software for injecting trojans onto mobile phones, and a trojan for spying on mobile phone conversations, text messages, and image messages on Android and for jail breaking an iPhone. Netizens thereupon took to the web and found similar orders on the sites of two other local law enforcement departments. The posts are a rare example of hard evidence of law enforcement surveillance practices. An Australian digital policy group criticized section 313 of the Telecommunications Act, which allows the Australian government to block websites without oversight, calling it a “matter of great concern.” The group, which represents Facebook, Google, and eBay, among others, made its statement in response to a parliamentary inquiry launched by Communications Minister Malcolm Turnbull. Turnbull is advocating that government agencies obtain approval and make a public announcement whenever a request is submitted that a website be blocked. Are EU Data Retention laws unconstitutional? A report from legal advisors to the European Parliament suggests national data retention laws may be unconstitutional, following the EU Court of Justice’s decision to strike down the EU Data Retention Directive. While a number of countries have rolled back their national data retention laws, others, including the United Kingdom, have continued or expanded these laws. The legal advisors found that these national laws have to remain compatible with the EU’s Charter of Fundamental Rights, which outlines rights to privacy and personal data protection. Internet insecurity by ISIS fans? U.S. Central Command or CENTCOM had its Twitter and YouTube accounts hacked by individuals who appear to be ISIS sympathizers. Although it was an embarrassing high-visibility hack timed to coincide with a speech by President Obama announcing new measures he plans to take to protect Americans’ privacy, reports indicate that no information was compromised.